It's time for another Control Freaks Blog Tour! Whether you came from Melissa Davies' Rubberfanatics blog or you're just arriving -- welcome!! I am excited to be a stop on your inspiration journey this month. Our theme this month is "Love is the in Air". 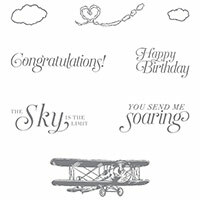 It's hard to see in this picture, but I stamped three clouds in Blushing Bride ink around the greeting. I absolutely love the way this next project turned out. I got a request for a private class. The hostess wanted to create a Valentine Sampler and this is what I came up with! I designed the sampler using pieces from the 140551 Love Blossoms Embellishment Kit, which I am including in the class fee. The finished size is 8" x 8". The squares are 2" x 2" layered on to 2-1/4" x 2-1/4" pieces of Rose Red, Blushing Bride, or Whisper White cardstock. Here's a close-up of some of the squares so you can see the detail. 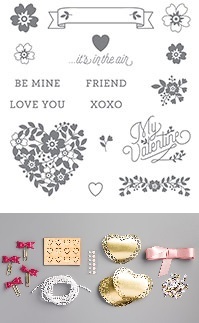 I used the Gold Wink of Stella on the small wooden heart. 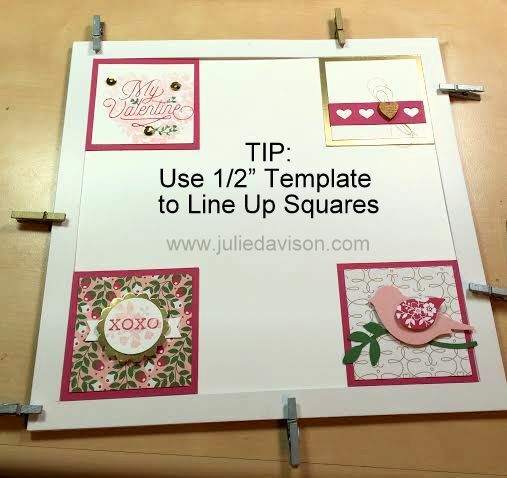 TIP: To line up the squares perfectly on the 8" x 8" base cardstock, create a template with a piece of cardboard. Cut a square out of the middle. I cut mine so the outside border is 1/2" on each side. Then use mini clothespins to hold the template to your cardstock. 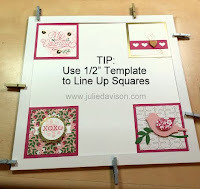 Start by gluing down the squares in each corner and then center the sides in between. That's all I have for you this time! I hope you'll come back and visit me again! I know you'll love the new projects I have in store for you! 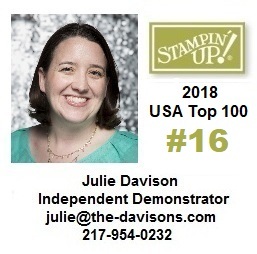 For now, carry on with the tour and head over to see what my friend Dawn Olchefske over at Do Stamping with Dawn has been working on! Ahhhh, *thud*! <<< (Me swooning) Your sampler is TO DIE FOR! I am so Pinning this! Love your clean and "lovely" Sky is the Limit card. And the sampler with the embellishment kit is a brilliant idea! Cute projects! Thanks for the helpful tips, too! I love that card, with the pinks and reds! :) The sampler is remarkable! So many beautiful ideas! Your private class surely must have been a huge hit. Such a pretty project and I love your first project using pink tones!